Makita has been one the dominating leaders in the power tool market. They came to Simply Displays with a need for their very best retailers. The goal of the project was to create a Makita environment that would showcase the full range of Makita Industrial Power Tools. What they wanted was more than just a display, but also an ultimate destination for the Professional power tool user. The space needed to inform the consumer of the various features and full scope of the line which ranged from lightweight drills to 70 pound breaker hammers. All tools needed to be accessible with the capability to handle and even demo the tool. 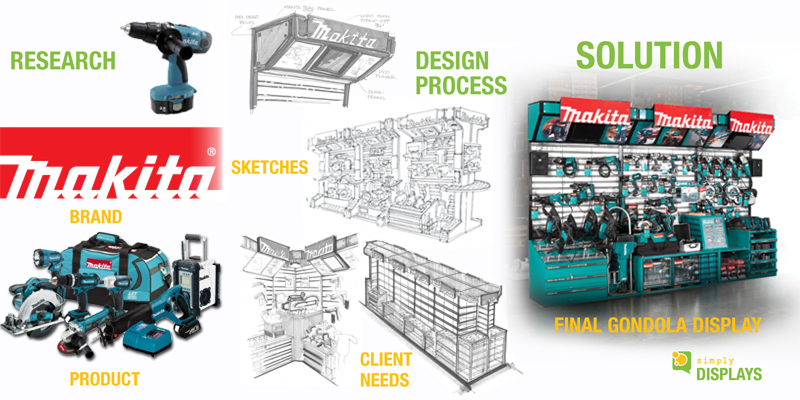 We pushed the boundaries of custom retail displays in both size and design by creating the Makita “Pro Center”- a flexible display system consisting of various specialty units and a grid system, complete with flat screen monitors and a high end sound system. Lit headers and changeable feature panels promote the brand. In addtion, there are areas for storage as well as product accessories. The Pro Center Program successfully increased Makita sales up to 30%.